We currently operate approixmately 100 tractors and 150 trailers. The largest part of our trailer fleet is food grade pneumatic trailers that are "Kosher Certified" and dedicated to hauling food grade dry bulk products. The balance of our trailers is dedicated to the hauling of alcohol and petroleum products. 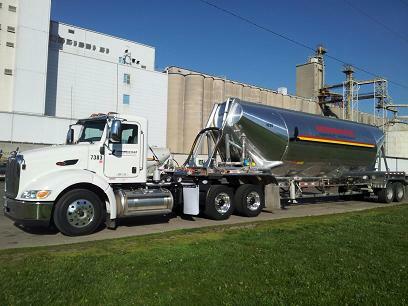 Our food grade fleet covers 48 states and Canada while our liquid fleet is more regional and specialized. <?xml:namespace prefix = v ns = "urn:schemas-microsoft-com:vml" /><?xml:namespace prefix = w ns = "urn:schemas-microsoft-com:office:word" />Commercial Transport Inc. has been hauling freight since 1938 and was incorporated in 1940. We got our start by providing dump truck service for the local construction industry. During this time, Scott Air Force Base in Illinois was expanding by adding new runways. After Commercial Transport finished hauling the materials for the runways, we started hauling fuel for the aircraft stationed at the base. As the war got into full swing, the demand for hauling products like these increased. This transitioned Commercial Transport into a new line of hauling capabilities. Transporting petroleum products has been a staple for our company ever since. In 1961, Commercial Transport was granted an ICC authority to haul bulk cement. The interstate system was expanding during this time and there was a growing demand for this type of transportation. Commercial Transport is still involved in dry bulk service, but the products have changed. Today, we concentrate on food-grade dry bulk products, such as flour and starch. We feel privileged to haul for most of the millers in the Midwest, as well as the major cereal manufacturers throughout the United States. Commercial Transport maintains a modern fleet of equipment with terminal operations in Belleville, Il; Indianapolis, In; Muscatine, IA; and Cape Girardeau, MO. These terminals support our fleet with maintenance and internal wash rack capabilities. We are now hiring experienced drivers that want to work for a company that takes care of their drivers!